TV host Ali Rosen shares her potluck pointers for the lazy cook in all of us. We’ve all been to those potlucks where everyone brings salad or mac 'n cheese or brownies and there ends up being no main course. Ali Rosen, host of the New York food and drink show "Potluck With Ali," wants to make subpar potlucks a thing of the past. 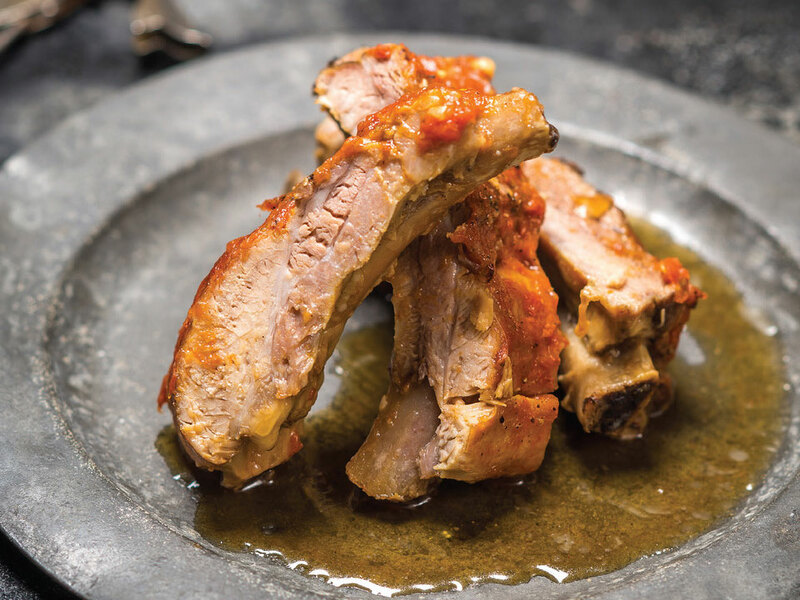 Which is why her new cookbook, Bring It!, is an answer to the eternal party question: “What can I bring?” On this week’s episode of Mad Genius Live, Rosen joined Food & Wine Culinary Director, Justin Chapple, to make her Roasted Watermelon Pork Ribs. The key to this recipe is the watermelon ketchup, which is essentially a purée of watermelon chunks and apple cider vinegar. Yet Chapple and Rosen caution against buying watermelon juice for this recipe, as it’s important to have the texture of the pulp in the sauce. For cubing the fruit easily and neatly, Chapple has a Mad Genius Tip, of course! He recommends taking a large knife and cutting horizontally at an angle. Rotate the melon and make the same cuts on the other side. Then, cut vertically from the top. With a spoon, scoop the chunks into a bowl. You’ll be left with clean and uniform chunks of watermelon. Ali Rosen of Potluck with Ali joins Justin Chapple this week to talk the best food and drink to feed a crowd. Drop your questions in the comments and we'll do our best to answer! Join us every Thursday at 11 AM ET for genius ideas in food, entertaining, travel and more. And if you make any of the recipes shown today, show us by tagging your Instagram photos with #MadGeniusLive! We might feature on next week's episode. While the watermelon and apple cider vinegar mixture should heat in a pan for 20 to 30 minutes, Rosen has a hack for when you don’t have time to wait that long. She says, “Get the widest pan you can find because the more surface area there is, the faster this will cook down.” Once the purée turns from pink and liquidy to a thick, red ketchup, you can freeze it, store it in the fridge, or use it right away on the ribs. The most important tip for the ribs is to line the pan with a few layers of aluminum foil, preferably the heavy-duty kind, and to cover the meat with even more foil after brushing it with the watermelon ketchup. Rosen recommends wrapping up the ribs as tightly as possible into a little package. This will prevent burning because the juices won’t leak out and it also makes for a super-easy cleanup. Plus, the foil packet also acts as the perfect carrying case for transporting the ribs. Although these ribs are great right out of the oven, Rosen likes them at room temperature, too, especially in cases where it might not be possible to heat them up. However you decide to serve these ribs, they’re sure to be a hit. “These are one of those things you bring to a party and everyone thinks you’re really fancy and actually you did very little,” Rosen, who is a self-proclaimed "lazy cook," says. For more of Rosen’s easy-but-impressive and innovative-but-doable recipes, buy her new cookbook.